Just after showing Samsung Galaxy Note II at IFA, Samsung announced Android powered Galaxy camera in front of everyone. 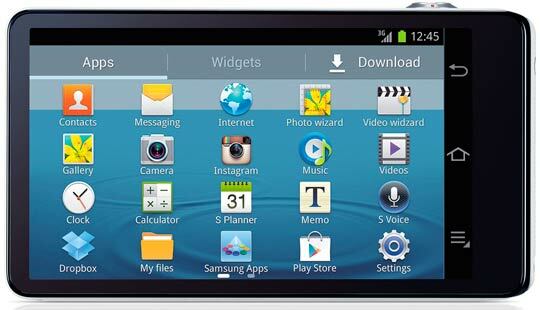 It’s a camera having Android 4.1 Jelly Bean built in with 3G, 4G and Wi-Fi connectivity built-in. 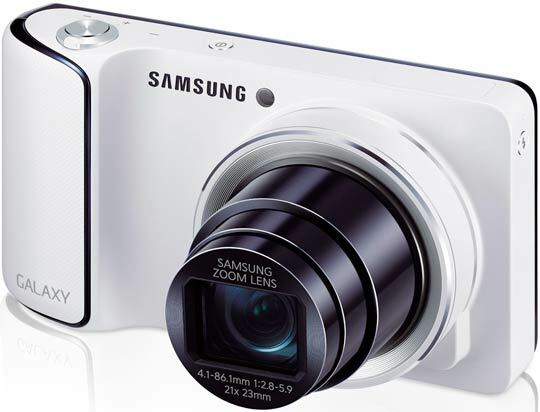 The Galaxy camera has a 1/2.3″ 16MP BSI CMOS sensor, a wide-angle lens (23mm in 35mm equivalent) and 21x optical zoom. There’s also a pop-up Xenon flash. The entire back of the camera is occupied by an edge-to-edge 4.8-inch 1,280 x 720-pixel (308 ppi) display. Having a touch-enabled viewfinder on a compact camera is certainly advantageous, I am using touch camera for the last 3 years with Sony T series. It’s awesome to focus anything I want. There are still a few hardware buttons on board, including a flash release (there's a pop-up strobe in the top right corner), a power button, zoom toggle and shutter release. It shoots 1080p videos at 30fps, but you can also do D1 (720×480) at 120fps. The camera will automatically back up the photos you’ve taken to the cloud – which will be done over the extensive data connectivity. There’s Wi-Fi a/b/g/n and penta-band HSPA available with optional HSPA+. Other connectivity features include Bluetooth 4.0, GPS and GLONASS. You get all sorts of apps that the Galaxy S III got, including S Voice, S Planner, a browser and so on with new Galaxy camera. It is powered by a quad-core 1.4GHz processor. There’s HDMI 1.4 available to output photos and videos to a TV. You get 8GB of built-in storage, which you can expand via a microSD card slot. The physical measurements of the camera are 128.7 x 70.8 x 19.1 mm and it weighs 305g. The battery has only 1,650mAh capacity. The Galaxy Camera will be available in Black and White. There’s no information about Samsung galaxy camera’s price or release date yet. Read the official PR to know more about this camera. BERLIN, Germany – August 29, 2012 – Samsung Electronics Co., Ltd, a global leader in digital media and digital convergence technologies, has today announced the launch of the GALAXY Camera. Developed to fit the changing ways we communicate, the GALAXY Camera combines high performance photography with the latest Android™ 4.1 platform, so called Jelly Bean, and wireless network connectivity, creating a brand new type of device. Samsung GALAXY Camera fits perfectly for those who wish to shoot, edit and share high quality photographs and video easily and spontaneously from anywhere, at any time. "The GALAXY Camera opens a new visual communication era and shifts a paradigm in communication. With the growth of social networks and the prevalence of smartphones and tablets, people today communicate faster than words. As we increasingly articulate our experiences through pictures and videos the GALAXY Camera has been created to lead the way in this new era of visual communication. Communication becomes more vivid and lively with high-quality images and instant sharing anywhere, anytime," said JK Shin, President of IT & Mobile Communications Division at Samsung Electronics. Andy Rubin, Senior Vice President of Mobile and Digital Content at Google, congratulated the Samsung team on their launch. "When we first started work on Android, we envisioned building a smart camera that would take digital photography to the next level. The GALAXY Camera is an innovative product that speaks to the openness and flexibility of the Android platform." The GALAXY Camera makes outstanding photography on the go. Users never again have to sacrifice picture quality if they want to edit and share their photos instantly. It easily outperforms any smartphone camera. The GALAXY Camera, boasting a 21x super long zoom lens and a super-bright 16M BSI CMOS sensor, delivers pictures in brilliant quality. The device also features 'Smart Pro' technology, a series of modes that make professional-looking photography easy for anyone to achieve. What truly revolutionizes this photography experience is Android™ 4.1 Jelly Bean and wireless connectivity, which opens up the device to applications for photo-editing, sharing, and much more. Users will experience all of GALAXY Camera's great features on a market-leading HD Super Clear LCD. With stunning clarity, incredible ease-of-use and unparalleled connectivity, the GALAXY Camera is the next step in imaging innovation. The GALAXY Camera's 'Smart Pro' feature makes it easy to recreate advanced photographic setups in just a few simple steps for stunning artistic results. Using the easy-to-navigate menu system, users can choose from a series of preset scenario options which will automatically adjust the camera's settings in order to capture the perfect photo. For example, the 'Rich Tone' setting delivers images with greater intensity – particularly effective for reducing overexposure in bright surroundings, while the 'Light Trace' setting automatically controls shutter speed for atmospheric night scenes full of light trails. The GALAXY Camera's 21x optical zoom can be controlled by either button or touchscreen, rendering long-distance pictures in a quality that users will be proud to share, while OIS ensures that images stay clear and crisp. The camera's 16 Megapixel 1/2.3" BSI CMOS sensor captures images in brilliant color and resolution, while the 23mm aperture lens delivers impressive wide-angle shots incomparable to smartphone pictures. The GALAXY Camera boasts large and vivid enough camera display - a 4.8"(121.2mm) HD Super Clear LCD screen, which makes it a pleasure to shoot, share and edit images from the palm of the hand. Another advantage of smartphone technology is the Voice Control option which allows the user to control a number of functions such as 'Zoom in' and 'Shoot' through voice. All these features are housed in a beautifully designed, ergonomic body with the GALAXY Camera's minimal, organic design complementing its easy-to-use professional features. The GALAXY Camera includes a comprehensive set of 35 powerful photo editing features through the 'Photo Wizard', allowing users to make professional quality edits on the go. The new features take advantage of the ultrafast quad-core processor and HD Super Clear LCD, giving access to a feature like Auto Face Calibration so edits can be made in precise detail and with ease. The 'Movie Wizard' also allows users to create and edit expert-quality videos easily from the touch screen. The GALAXY Camera also features 'Smart Content Manager', an innovative on-device organization tool which intelligently creates folders, tags faces, and even suggests which pictures to delete when they don't come out as desired. Thanks to the combination of wireless connectivity and Android™ 4.1 Jelly Bean OS, the internet capabilities of the GALAXY Camera are equal to those of the latest smartphone so that users can get even more enjoyment out of their device. In addition to the pre-installed applications from Samsung, users can browse the web and enjoy any applications from Google Play or Samsung Apps stores. If users are not sure which app to download, 'S Suggest' will help them recommend a new photo editing app or fun game to download. The camera's convenient 'Auto Cloud Backup' feature will automatically save precious photos into the cloud via Samsung's AllShare the instant they are taken. The GALAXY Camera also allows users to share photos at the same time as they shoot them with 'Share Shot.' As well as sharing to social networks and cloud services, users can also connect to a range of GALAXY devices including the GALAXY SIII and GALAXY Note II for effortless and automatic sharing of pictures across the GALAXY family. The new device enables connection to 3G or 4G, allowing photo sharing and browsing anywhere. The GALAXY Camera also functions on Wi-Fi with Dual Band and Channel Bonding for extra speed. Connectivity is supported by a quad-core processor that enables fast web-browsing and multi-tasking, as well as high-speed image processing without a significant impact on battery life.